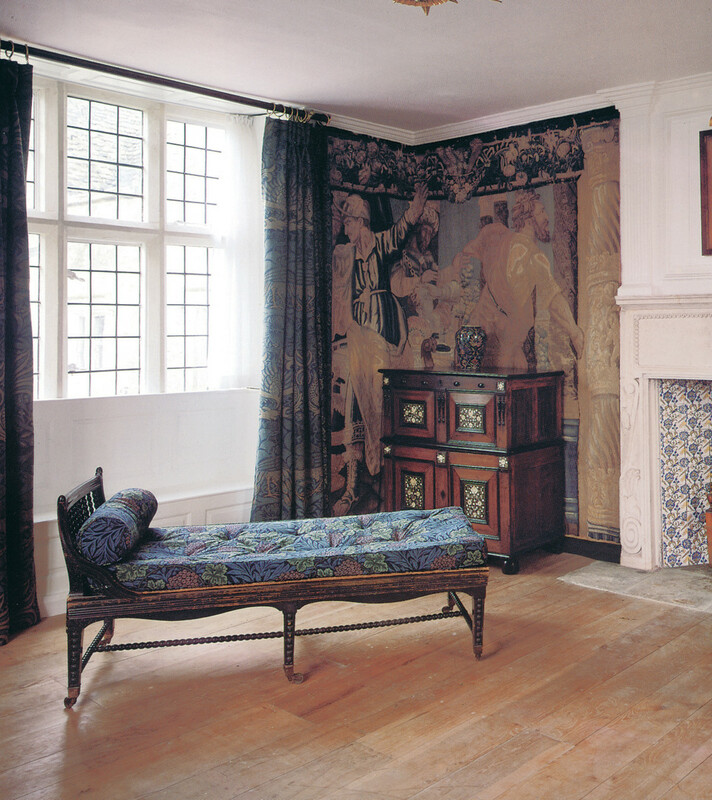 The tapestry room at Kelmscott Manor expresses the Arts & Crafts philosophy of British tastemaker William Morris in aged textiles and simple furniture true to the medieval ideal. “Chippendale, Shaker, Danish Modern—these styles of the past are easy to identify ... not so Arts & Crafts furniture in its many forms,” wrote revival furniture maker Kevin Rodel in the book Arts & Crafts Furniture. Designers from London to Vienna, in Glasgow and Syracuse, Chicago and Pasadena created furniture that was extremely diverse. That’s true in today’s revival, as well. 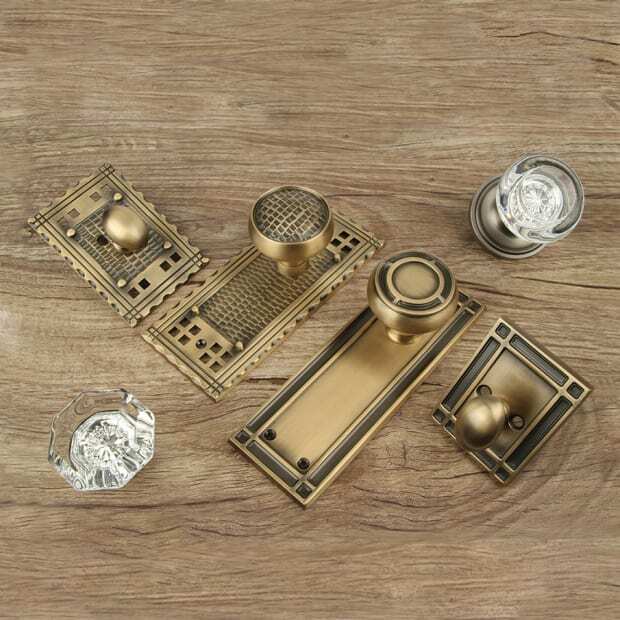 Artisans are creating not only reproductions and adaptations but also wholly contemporary pieces, deemed Arts & Crafts only because they may be designed, built, and finished by one maker. In an Arts & Crafts Tudor house, oak dining chairs with stylized cutouts were identified as by the French Art Nouveau designer Leon Jallot. British work by designers including Godwin, Voysey, and Mackintosh, too, was often delicate, Mackintosh’s clearly influenced by Art Nouveau. Rodel points out that the furniture may even seem contradictory. 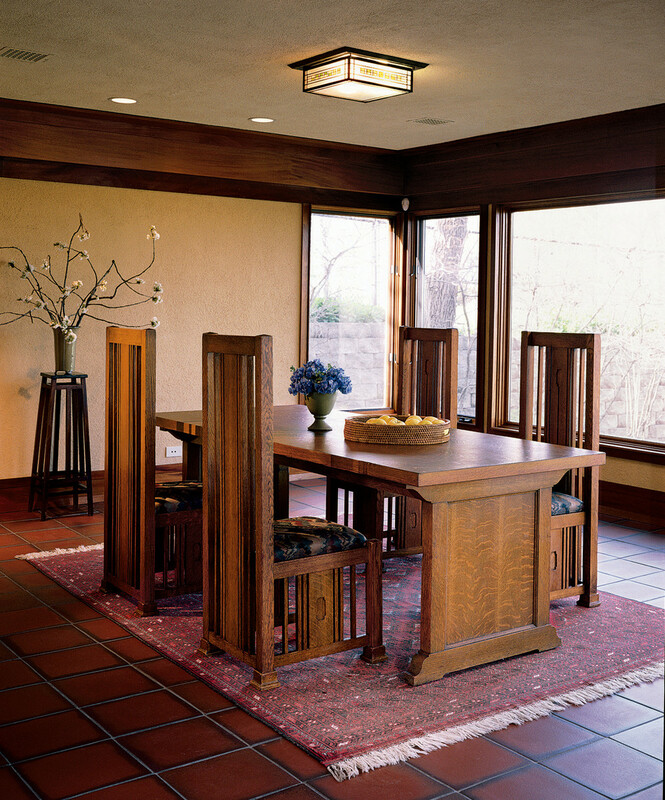 Look at the American pieces—especially Stickley’s solid, rectilinear “Mission” furniture. It’s not hard to see its relation to the somewhat more refined Prairie School furniture of Frank Lloyd Wright and George Mann Niedecken. But how is it related to the attenuated Modern work of Charles Rennie Mackintosh in Scotland, or to the Gothic and Jacobean inflections of much English Arts & Crafts design? 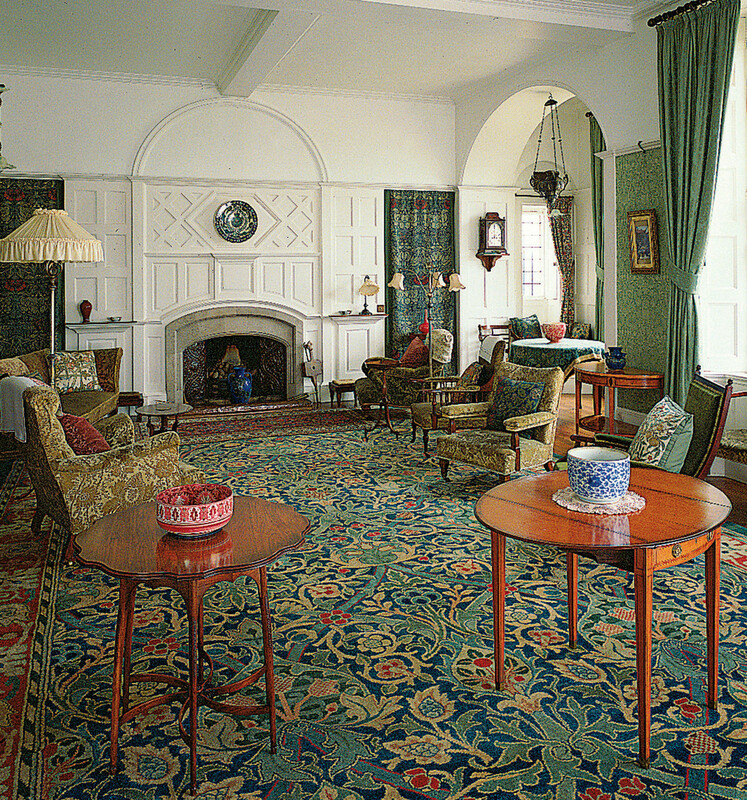 The variance between American and British Arts & Crafts is clear in the drawing room at Standen (1894), an acclaimed house by Morris collaborator, architect Philip Webb. 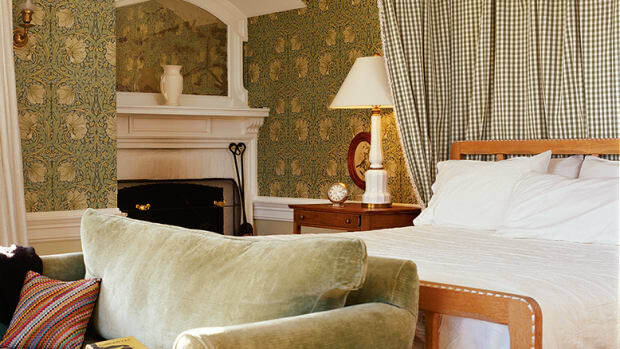 Note the exaggerated design of the fireplace wall, and upholstered furniture. Furniture can’t even be defined by its being hand-made. Craft traditions were upheld and the guild method revived, but then again, Gustav Stickley’s mortise-and-tenon joints were made by machine in his factory. 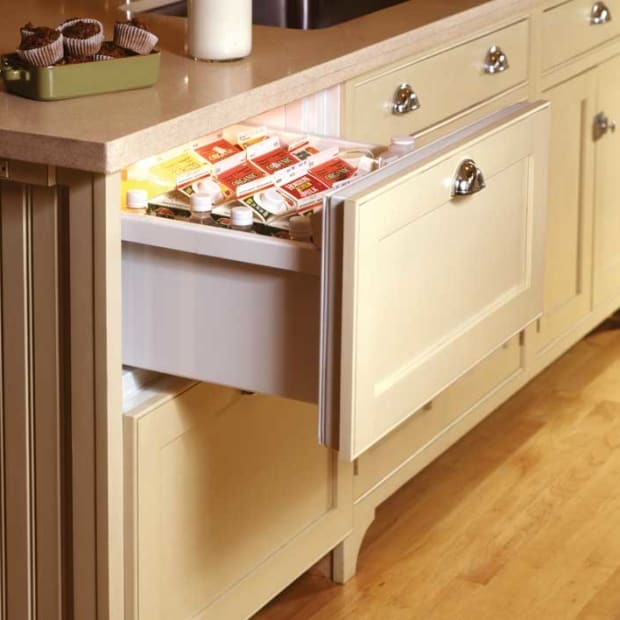 Exposed joinery (done by hand or machine) is a leitmotif of American Arts & Crafts furniture. Yet British and Austrian furniture very often was built with hidden joinery, in keeping with the long tradition of fine furniture-making. 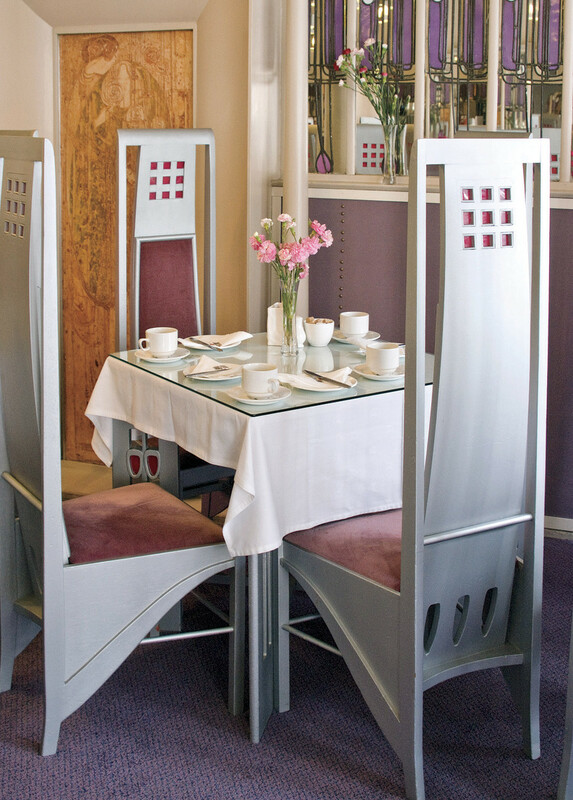 Mackintosh’s version of the highbacked chair contributes to an unparalleled aesthetic at the Willow Tea Rooms in Glasgow. The use of domestic woods, especially such “humble” species as oak, is a common thread. Plain furniture is typical, but Ernest Gimson in England and Stickley’s designer Harvey Ellis used inlaid marquetry. Art Nouveau, the contemporaneous design movement that began in France and Belgium, is known for sinuous lines and ornamentation. Most period Arts & Crafts furniture was clear-finished, stained, or fumed to darken it. Then again, Mackintosh used opaque black and white paints. An important influence, held over from the Aesthetic Movement that had so embraced Japonisme, is Asian design. You can see Japanese and Chinese influences (in aesthetics and joinery) in the work of California architects Greene & Greene. Asian influence is even more visible in the fusion work of the revival. 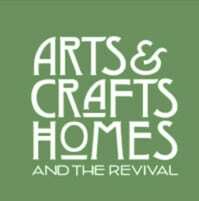 Arts & Crafts became truly American in its design, manufacture, and its marketing. No matter than its antecedents are medieval, its influences English and Japanese, or that its greatest proponent was Gustav Stickley, the son of a German stonemason. 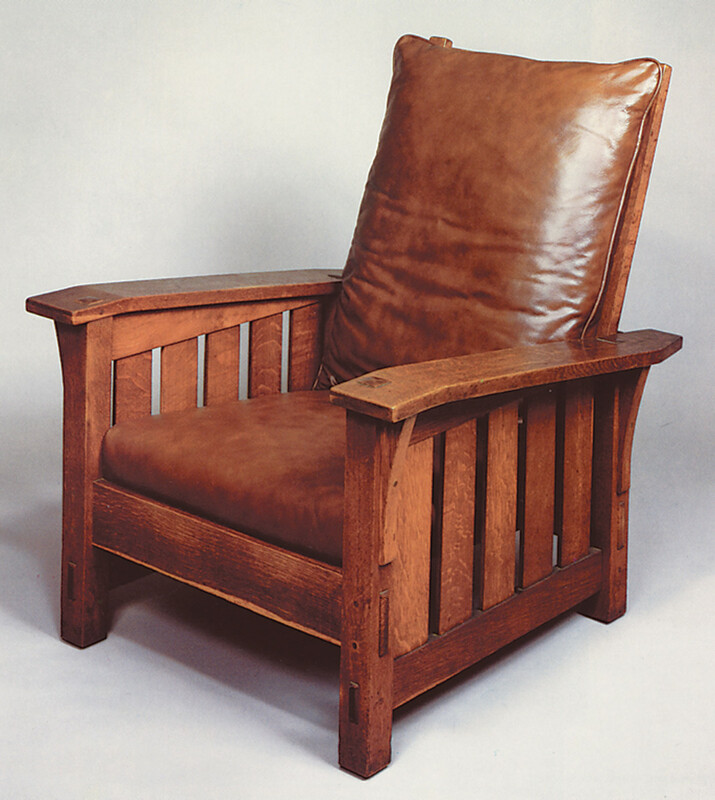 Although Gustav Stickley and his peers struck a chord by promoting the Ruskinian ideal of the individual furniture maker as both artist and craftsman, production demands forced them to embrace the machine and some factory techniques. Today, many of the hundreds of people who make A&C furniture do design, build, and market their work themselves. But once again, expensive artisan-made furniture has as competition factory-made pieces and even cheap knockoffs. 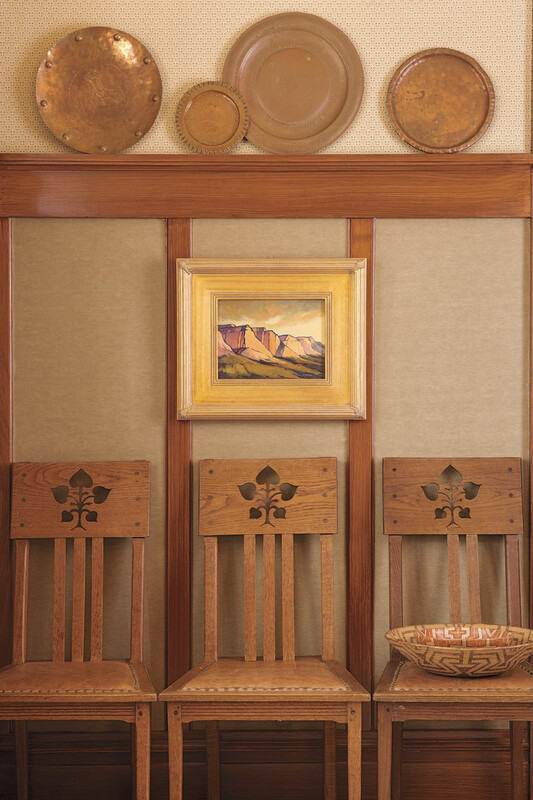 Wright’s Prairie School designs favored spindles over Stickley’s slats, and suggest some British influence; this Barrel chair (1937) is an evolution of earlier designs. 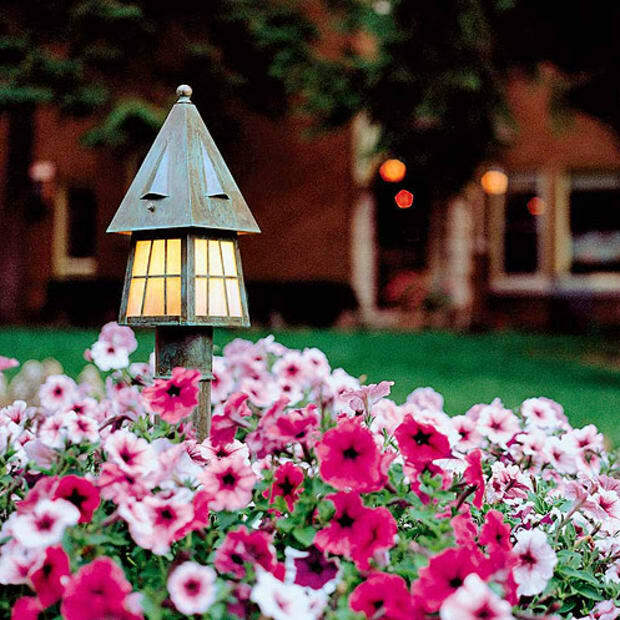 Today’s buyers may be looking to comfortably furnish an entire house, or they may be looking for a work of art. The artisan piece has the idiosyncrasies of the maker and is often interpretive, bringing Arts & Crafts into the present. 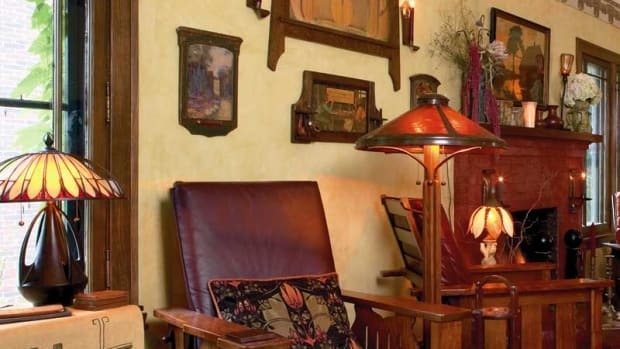 For factory-reproduction American Arts & Crafts furniture, the gold standard is undoubtedly Stickley, which still produces “re-issues” of originals by Gustav Stickley, Harvey Ellis, and L. & J.G. Stickley, as well as newer, Greene & Greene-influenced and interpretive lines. A vernacular chair design from Sussex, England, was adapted for sale by the firm that would become Morris & Co. 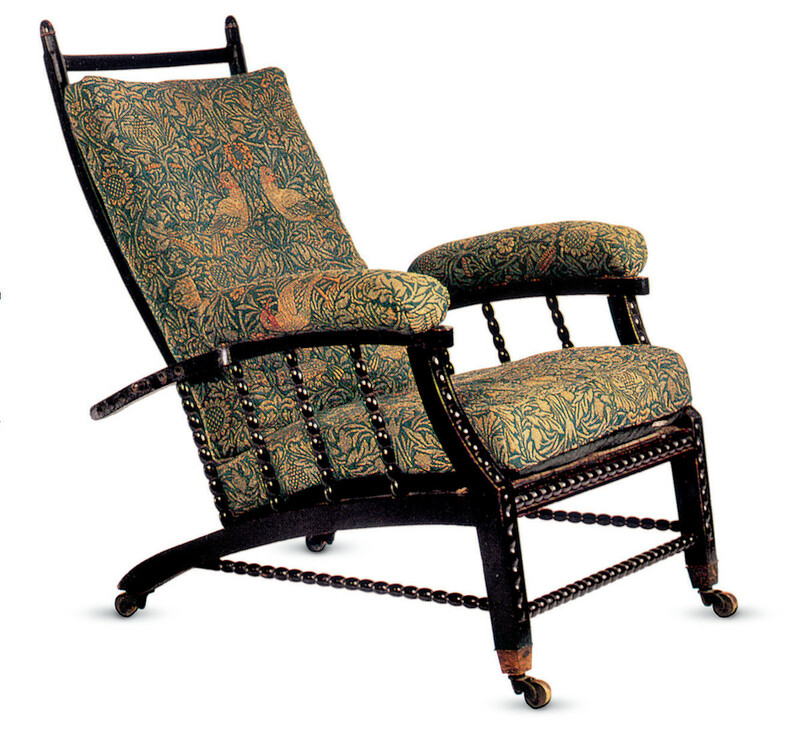 In 1865 a vernacular chair design from Sussex, England, was adapted for sale by the firm that would become Morris & Co. The recliner concept morphed from the English original (left) to Stickley’s version (right). Stickley’s version of the Morris Chair. So often these three words are used interchangeably, with good reason. 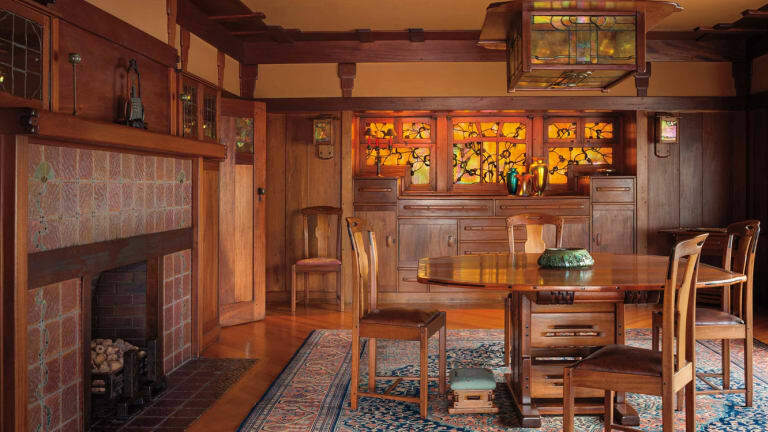 Gustav Stickley, the most influential promoter of Arts & Crafts philosophy and design in America, affected taste not only through his furniture workshops and persuasive catalogs, but also because of his highly influential magazine The Craftsman (pub. 1901–1916). 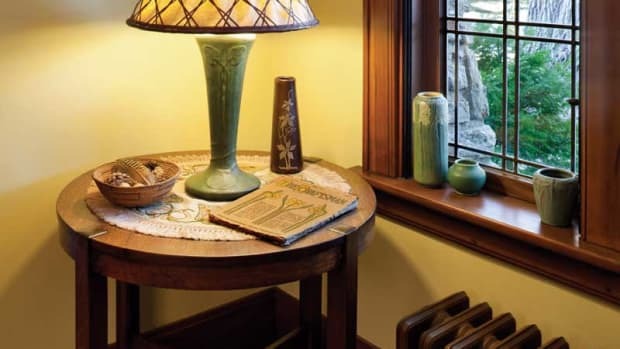 Companies including his advertisers co-opted the word “Craftsman,” which became a generic term for American Arts & Crafts houses, furniture, and decorating through the late 1920s and ever since. Also, Stickley was quite literally a family of companies; four of Gustav’s brothers were competitors making furniture from New York to Michigan. “Mission” was first used by a New York furniture maker in the late 1890s, a reference to colonial-period missions. How it came to be a synonym for Craftsman is unclear. The roots may lie in Stickley’s role as a missionary for simple tastes and the family hearth; usage may also stem from his magazine coverage of the California missions restoration efforts. That heavy, boxlike Spanish furniture does indeed bear a resemblance to Craftsman furniture. (Another maker, Charles Limbert, insisted that the old Spanish furniture had Dutch antecedent, which can be argued.) 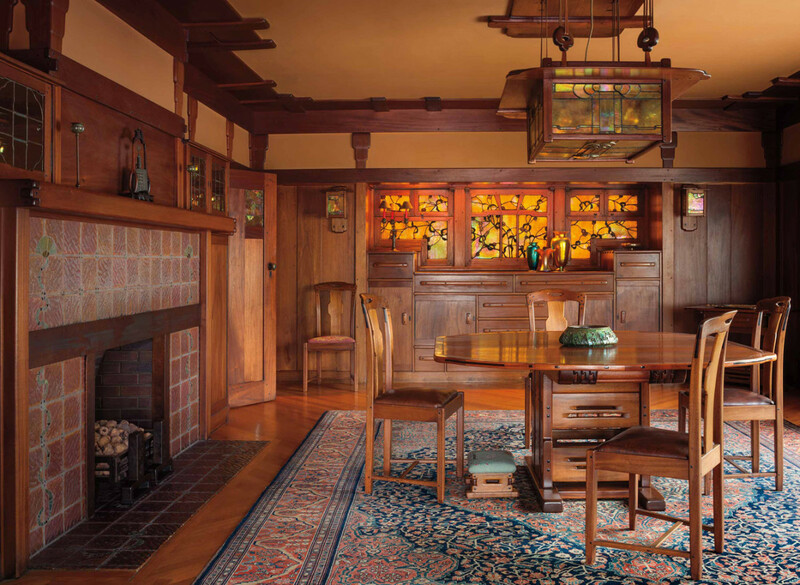 Prairie School furniture is clearly related to Craftsman, especially the seating, but it tends to be less bulky and, sometimes, as with Wright collaborator Niedecken’s designs, more ornamented. All of these related strains gained popularity with the proliferation of artistic bungalows during the period. 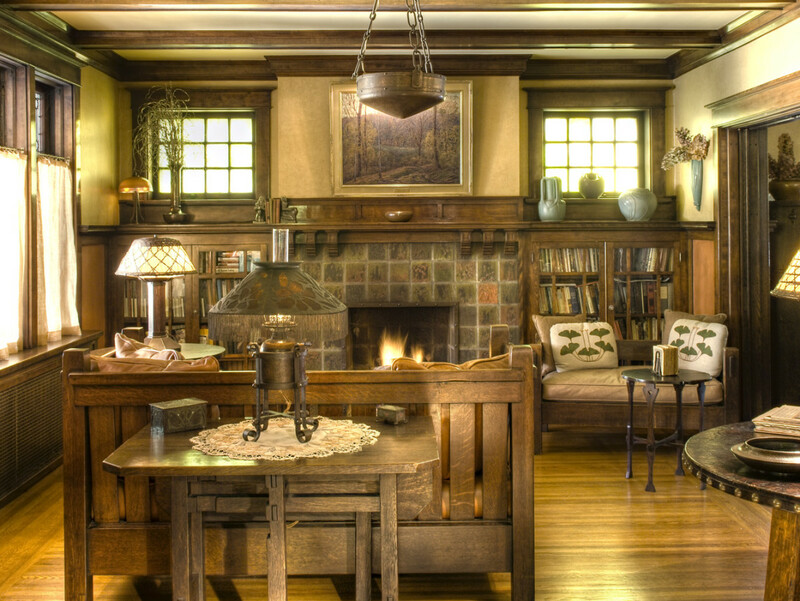 Dark woodwork, beamed ceiling and built-ins, muted tile, earthy colors, pottery, and nature motifs make this the quintessential Craftsman room as promulgated by Stickley. Oak furniture is early Stickley, including the ca. 1901 slatted crib settle and a leather-top library table, ca. 1902.